China is a large exporter of LEATHER, including skins from cattle, sheep, and even CATS & DOGS. Because leather isn't labeled, you don't know whose skin you're wearing. Most leather comes from developing countries such as Indiaand China, where animal welfare laws are either non-existent or not enforced. In India, a PETA investigation found that workers break cows' tails and rub chili peppers and tobacco into their eyes in order to force them to get up and walk after they collapse from exhaustion on the way to the slaughterhouse. Buying leather directly contributes to factory farms and slaughterhouses because skin is the most economically important byproduct of the meat industry. Leather is also no friend of the environment, as it shares responsibility for all the environmental destruction caused by the meat industry as well as the pollution caused by the toxins used in tanning. With every pair of leather shoes that you buy, you sentence an animal to a lifetime of suffering. Instead, you can choose from hundreds of styles of nonleather shoes, clothing, belts, bags, and wallets. Fashion should be fun, not fatal! ......Every year, the global leather industry slaughters more than a billion animals. Most of the leather in the U.S. and Europe comes from India, China, and other countries that either have no animal welfare laws or have laws that go largely or completely unenforced. As India's own animal protection laws are blatantly ignored, unsanitary slaughterhouses continue to pollute the environment; unlicensed, illegal slaughterhouses remain in operation; and the widespread abuse of animals persists. Commercial vehicles crossing Indian state lines are required to pay taxes, so animals are often transported by truck within the state and walked across the border, where they are loaded back into severely crowded trucks. Indian law requires that not more than six cattle be transported in a truck at one time, but this law is routinely ignored. However, to avoid any problems at state borders, some cows are dragged off the trucks, marched over the border, and then loaded back into the trucks. Many cows are trampled or gored in these extremely crowded, illegal transport trucks during the long journey to slaughter. Because India's animal transport and slaughter laws are not enforced, many of the animals used for leather are so sick and injured by the time they arrive at the slaughterhouse that they must be dragged inside. Once inside, their throats are cut—often with dirty, blunt knives and in full view of one another—on floors that are covered with feces, blood, guts, and urine. Some animals are even skinned and dismembered while they are still conscious. If you're wearing leather, it most likely came from China, the world's leading leather exporter. In addition to the cattle, sheep, and other animals who are killed for leather in China, an estimated 2 million cats and dogs in China are killed for their skins each year. Confined to wire cages in which they can barely move, these animals are routinely skinned alive and hacked apart, piece by piece, until they bleed to death. Many products made from the skins of dogs and cats are bought unknowingly by consumers because the products are often intentionally mislabeled and do not accurately indicate their origins. 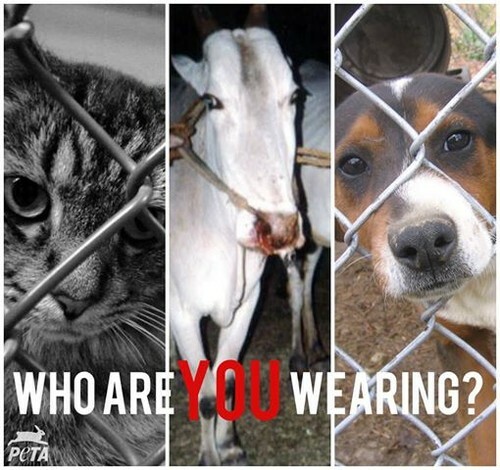 If you're wearing leather, you're wearing the skin of a horribly abused animal. Even if your shoes were manufactured in Italy, the U.S., or another country, the raw materials (skins) are probably from India, China, or another country with similarly nonexistent animal welfare protections. With so many stylish synthetics now available, there is no excuse for supporting animal abuse. The best thing that you can do to help animals killed for their skin is to boycott all leather products and urge everyone you know to do so as well. /Väl värt att tänka på alltså! Jag skulle aldrig kunna bära läder på min kropp. Provade en sjukt snygg läderjacka en gång, men då jag såg att den var 100% svinskinn så kunde jag inte sluta tänka på den stackars grisen som fått offra sitt skinn för denna jacka. Därför kör jag bara på fejk läderjackor!